"Tortillas filled with a chicken, rice, beans and olive mixture - rolled, fried and topped with a piquant avocado mix, sour cream and cheese, all served on a bed of lettuce. Being raised 12 miles from the border of Mexico, I was brought up on Mexican food and learned how to make many of the dishes." In a medium saucepan combine the broth, rice, sauce, and 1 diced onion. Mix and bring to a boil; reduce heat to low and let simmer for about 20 minutes, or until rice is tender. Meanwhile, heat tortillas in a large skillet (so that they are soft enough to fold). When rice mixture is ready, spoon equal amounts of the following onto each tortilla: Chicken, shredded Jack cheese, diced onion, olives, rice mixture and beans. Roll tortillas, tucking in sides to prevent filling from spilling over. 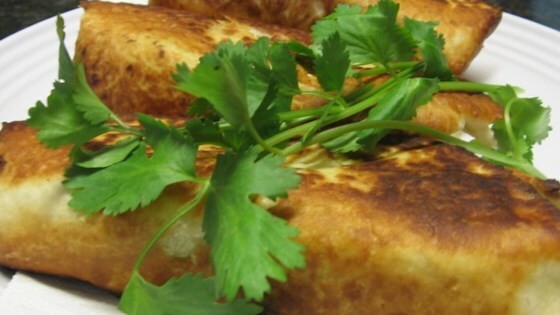 Heat oil in a large skillet and fry the filled tortillas, turning, until browned on all sides. Drain on paper towels. To Serve: In a medium bowl combine the avocados, cilantro, lemon juice, green onions, chile peppers and tomatoes. Mash together. Place shredded lettuce on a platter, topped with chimichangas, avocado mix, sour cream and shredded Cheddar cheese. My sixteen year old said these are the best chimi's he's ever had. Too bad they are kind of time consuming but I will now have to make them again when you get a compliment like that. this is a great recipe - you may want to add a red enchilada-type sauce to pour over the chimis. very tasty and easy to make!